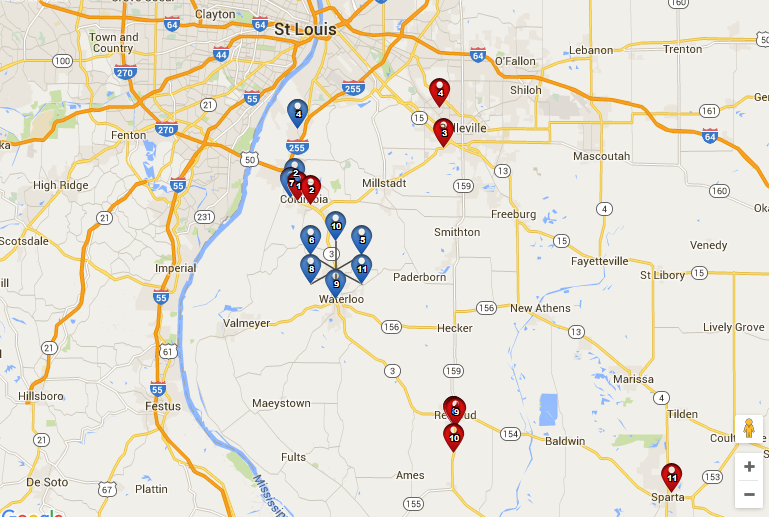 Geo locate and time stamp all customer visits. Fluid forms., The Front row app will allow mobile workers to review all forms and reports previously submitted about a client. What a tremendous productivity tool for their next client contact. Fluid forms in addition to allowing review also allows the mobile worker to add, update or edit previous forms and reports. Every company can improve their communication system. Front Row provides a system that allows management to quickly and easily connect with their sales reps. 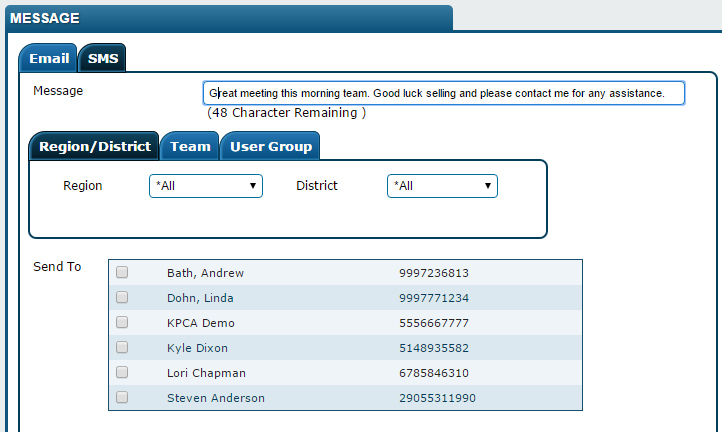 The Front Row message center allows the management team to send an email or text message out to the field. The texting component has a reported open rate of 98% in less than 5 minutes. This is a fantastic way of getting a message across to your reps. Imagine being a manager using Front Row and seeing a report come in with a fantastic sale attached. The manager can use the message centre to immediately send a text back recognizing the successful merchandising visit. Management can also send a text to all the reps announcing a policy change or customer specific directives. 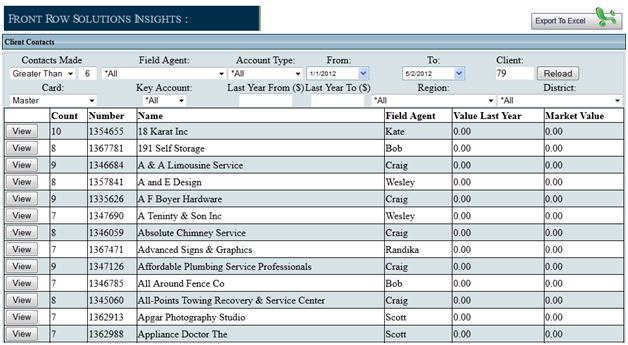 The Front Row system provides both generic and custom reports to our clients. Below you will find 2 reports that will provide insight into your merchandising performance and customer data. In this report we are showing the Results for one rep from one week of merchandising calls. Notice that you have the week broken down into 5 individual days. You can see the first and last call of each day and the sales result. The Results for one rep from one week of merchandising calls. You will be able to get this type of information for every merchandiser in any time frame. In report 2 we are comparing merchandiser activity and sales amount since the start of the year. 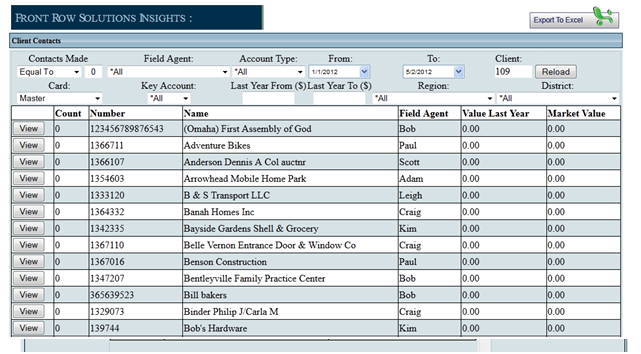 You will be able to view the activity levels of each merchandiser and total sales by each merchandiser. This will also allow you to obtain the average sales amount by merchandiser. The selectable filters will allow you to change any date range, any region or district, or even individual merchandisers. Never before has it been so easy to analyze your merchandising team and find your most productive merchandisers.